February 7, 2012 - 17:48 AMTPanARMENIAN.Net - Istanbul-based Armenian writer Sevan Nishanyan has been jailed in Turkey for alleged illegal construction. Nishanyan was sentenced to 5 months for construction of a cemetery in Selçuk district of İzmir Province, NTV reported. Nishanyan has repeatedly been detained for alleged illegal construction. A few years ago he reconstructed old constructions further to operate them as hotels. illegal construction. ? ok what was he constructing ??. Turkish Armenian writer faces jail term for "insulting religions values"
PanARMENIAN.Net - Istanbul Prosecutor's Office instigated a criminal case against Turkish Armenian writer Sevan Nisanyan over "offending religions values through expressing views insulting prophet Muhammed in his article." In the days to come, Nisanyan will be summoned to Istanbul Criminal Court. The writer may face a jail term of 9 months to 1,5 years, Anadolu Agency said. When are we going to learn that turkey is like a snake, it bites the hand that feeds it. Mr. Nisanyan what did you expect? So many Armenians before you did the same as a loyal citizen worked hard in turkey as other Armenians did in other countries with one exception they got awarded where as in turkey you get jailed and eventually killed. and never hesitates to speak bluntly about the Armenian genocide. his jail term really to punish his contrarian views? subject to such restrictions were never presented for Sirince. Nisanyan could well spend the rest of his life in jail. obvious that the fact that I am Armenian plays a role in this process. think hard about to understand Turkey. article about him, and posted the link of the article. had condemned him to prison. stood out by his fearless manners in Turkey. intelligent and educated person, whom I have ever met. which can be used by all the people, who are interested in the matter"
his release" - added the student. intellectual on his bag and walked around Turkey. ISTANBUL (PanArmenian)—The prison sentence of Turkish-Armenian linguist and writer Sevan Nisanian, who was jailed on charges of illegal construction, has been increased to 11 years and 8 months, Agos reports. Nisanian, imprisoned at the Aydın Yenipazar Prison at the moment, was sentenced in a different case to a total of 5 years 2 months 15 days imprisonment and given an additional fine of 12.600 TL by the Selçuk 2. Criminal Court of First Instance for opposing the Code of Protection of Cultural and Natural Properties (KTVKK). With the addition of this sentence, Nisanian’s total prison sentence now stands at 11 years 8 months. Nisanian’s lawyer Murat Akçı has stated that they will appeal these rulings as well. In March, the sentence passed for the same charge was reversed by the Supreme Court of Appeals, however, following a reassessment of the four files by the local court, Nisanian was found guilty of “intentionally causing damage to immovable cultural assets under protection”. Akçı explained that they did not even know the number of cases filed against Nisanian on such charges, because regional protection decisions that form the basis of such charges are taken without being served to the person in question. Therefore, the person who is sentenced does not even know which of his or her acts was deemed to be within the scope of crime. Armenian Weekly – According to reports, jailed Turkish-Armenian intellectual, travel writer, entrepreneur, and researcher Sevan Nisanyan has escaped prison and fled Turkey. Nişanyan was jailed on Dec. 2, 2014 for “construction infractions.” “The bird has flown. Wish the same for 80 million left behind,” Nişanyan said in a Tweet on July 14. Nişanyan confirmed the reports to Turkish Habertürk news agency by phone but declined to give details of when and how managed his escape. Nişanyan was sentenced to a total of 17 years in a number of cases, Agos news reported. 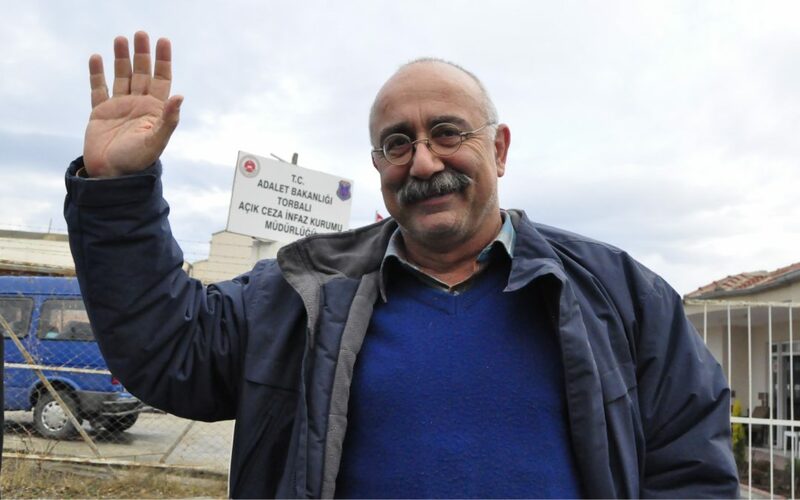 “If Nişanyan really has escaped from prison, I would like to congratulate him,” said Turkish-Armenian journalist Hayko Bağdat, who has been living in exile in Germany, in a tweet. Nişanyan came to public attention in Turkey in January, when he announced that Turkey’s Justice Ministry had banned all newspapers and books from prisons except for the Quran as of Jan. 9. The Armenian Weekly will be closely following developments and provide updates as they become available. Well-known Istanbul Armenian writer, linguist, journalist, and columnist Sevan Nișanyan, made the second tweet after escaping prison in Turkey. Nișanyan escaped prison and fled Turkey on July 14. “The bird has flown. Wish the same for 80 million left behind,” he tweeted. Sevan Nișanyan was sentenced to 11 years and 6 months for carrying out illegal construction. He has constantly raised the Armenian Genocide issue in Turkey, and stood out by his fearless demeanor in this country. WATERTOWN, Mass. (A.W. )— In a recent interview with Armenian Weekly correspondent Gulisor Akkum, Sevan Nişanyan, who escaped prison and fled Turkey on July 14, said that Turkish President Recep Tayyip Erdogan’s regime’s days are numbered and that he will eventually return to his home country. “I am sad that I will be away from my village and my home for a period of time. But I do not believe this political insanity in Turkey will continue for too long. This regime is going to go, and we will return!” the Turkish-Armenian intellectual, travel writer, entrepreneur, and researcher told Akkum. Nişanyan was jailed on Dec. 2, 2014, for “construction infractions.” The charges that had him locked up stemmed from the renovations and additions to his hotels in Sirince, an old Greek village in Izmir that has become a tourist destination thanks to Nişanyan and his rustic hotel business. “The bird has flown. Wish the same for 80 million left behind,” Nişanyan said in a Tweet on July 14 upon fleeing the country. He also changed his profile photo on Twitter in the evening hours of July 14 and replaced it with a photo of a flying bird. Nişanyan has since posted three new photos on his Facebook page, without specifying his location. The caption of one of the photos, which has since been removed but continues to be shared among several media outlets, simply reads “fugitive” in Turkish. Nişanyan confirmed the reports of his escape to Turkish Habertürk daily newspaper by phone, but declined to give details of when and how he managed to flee. “I do not want to comment on that topic. It is a bit too early to talk about methods and procedures. I will tell all the details when the time comes, let no one have a doubt. But, it is not yet the time,” Nişanyan told the Turkish daily. “I thought the 3.5 years [I served in prison] was enough. Therefore, I thought it was now time to take a bit of a breath. This is what happened. Utilizing some unique circumstances or deficiencies of Turkey, in this situation, I have decided to go out of our state’s control,” he added. According to some reports, Nişanyan was allowed to leave prison for one day every three months and simply did not return after his latest sanctioned leave. Nişanyan was sentenced to a total of 17 years in a number of cases. The Greek asylum agency granted the permit for 6 months. in prison. There are many people whom I’d like to thank”, he said. was sentenced to 17 years in prison. The scholar escaped from the minimum security prison on July 14.
contradicting to the development plan. notification over the demolition of one of the buildings. however, it was postponed for various reasons. the premises and never returned. away – with the same wishes to the remaining 80 million”. “illegal” construction in his own garden. Turkish-Armenian linguist and writer Sevan Nişanyan, who escaped from prison last month, has said his money at a bank was seized by the government. Jailed on nine different charges including illegal construction in 2014, Nişanyan escaped from Foça prison in Turkey’s western province of İzmir on July 14, and said he applied to for political asylum in Greece on July 26. The writer was sentenced to a total of 17 years in a number of cases, Agos newspaper earlier said. “I had TL 12,000 [$3,400] for dark days. I have found out that Turkey has seized it as they couldn’t find anything else. This is not a state, this is a group of gangsters,” Nişanyan wrote on his Facebook account. Turkey earlier seized properties belonging to several journalists and businessmen who were targeted as part of Turkish government’s post-coup crackdown. Famous Istanbul writer of Armenian origin Sevan Nisanyan posted a photo with famous Turkish historian Taner Akçam on his Twitter account. Sevan Nisanyan commented the photo with the words: "With Taner Akçam, in the process of creating projects concerning the future of Turkey. Don't worry, everything will be fine." It should be noted that Taner Akçam is the author of numerous works proving the fact of the Armenian Genocide. Sevan Nişanyan took a vacation from prison but never showed up again. It was later found out that the Greek authorities granted him temporary residence. Nişanyan was sentenced to 11 years in prison by the Turkish courts for illegal construction. He has always openly spoken about the Armenian Genocide and showed courageous stance.